The Flipcause CRM provides a comprehensive and centralized way for you to view and manage all of a supporter’s activity history and personal details in one place. 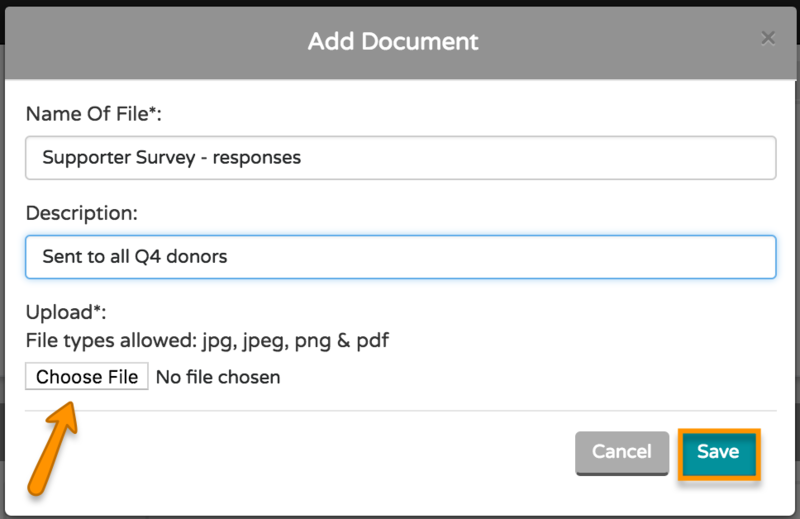 From the Contact Database, you’ll be able to better manage stewardship and communications and oversee fundraising efforts. 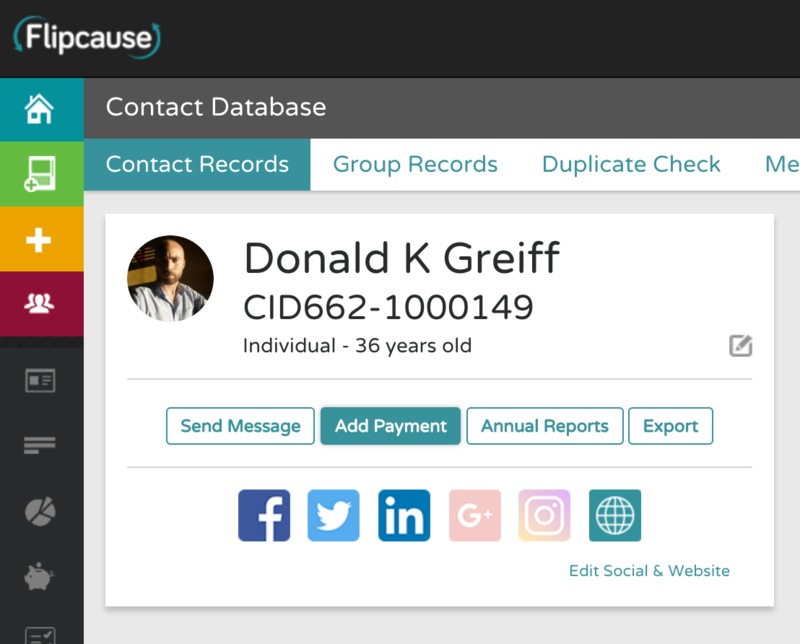 All personal information and transaction data collected through your Flipcause campaigns is automatically synced with your Contact Database, and all supporter activity is aggregated into Contact and Group Profiles. Contact Records are profiles for individual people and businesses in your database. 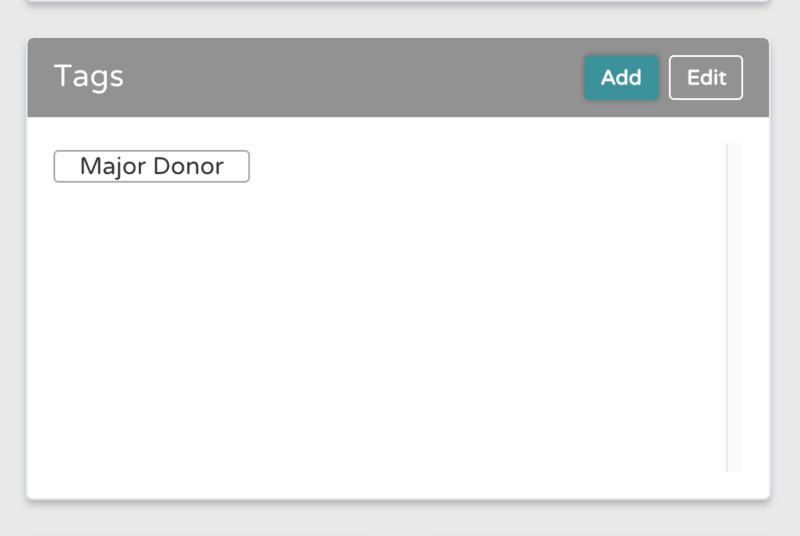 You can add any custom Tags to your Contacts and Groups to provide more information on which to sort and filter your database. You can create a tag from the Tag Manager by clicking "Add Tag"
Once created, you'll be able to add tags from the Tags area of your Contact and Group Profiles. Go to Contacts, View Contact Profile of the person for whom you'd like to assign the tag, and click Add. You will be able to filter your Contact reports using these tags. Is there information you'd like to collect from or questions you'd like to ask of your supporters that isn't already part of Flipcause standard fields? Using Custom Fields, you can set up any kind of custom questions for your campaigns and database. 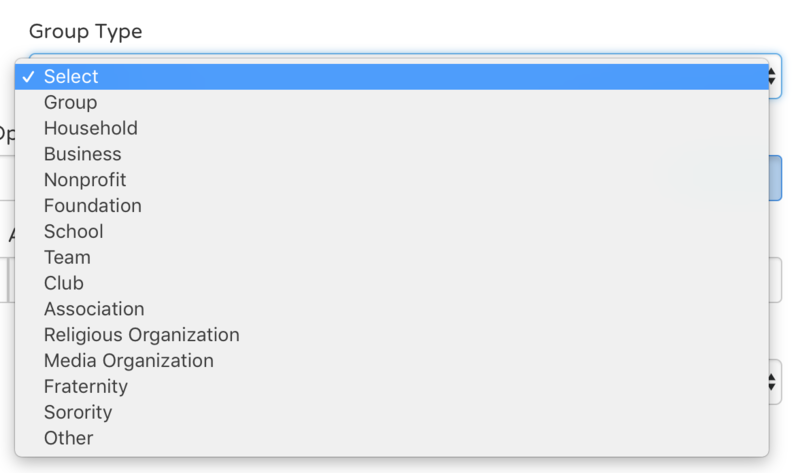 Once these are set up in the Custom Fields area, you can apply these to your Contacts and Groups within your CRM. Go to the Contacts tab on your dashboard and find the Contact Profile of the person you're looking for. Scroll down until you see Custom Fields. Click the Add button at the top of the Custom Fields area. Find the custom field from the dropdown menu of custom fields. Enter the custom field response you'd like saved for this person. Your custom field information will now be displayed on your Contact Profile. 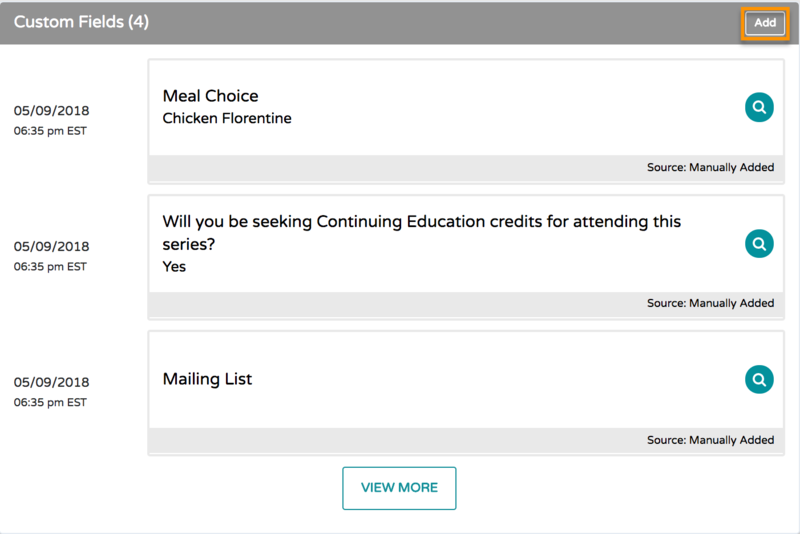 You can also view responses to Custom Field questions from within a supporter's Contact Profile. Click the VIEW MORE button at the bottom of the Custom Fields area. You will see a list of all the Custom Field responses for that Contact. By default, the date range will filter results from the past 30 days. If needed, modify the Date Range and select a Custom Field Source, then click Filter Records to refine your list. 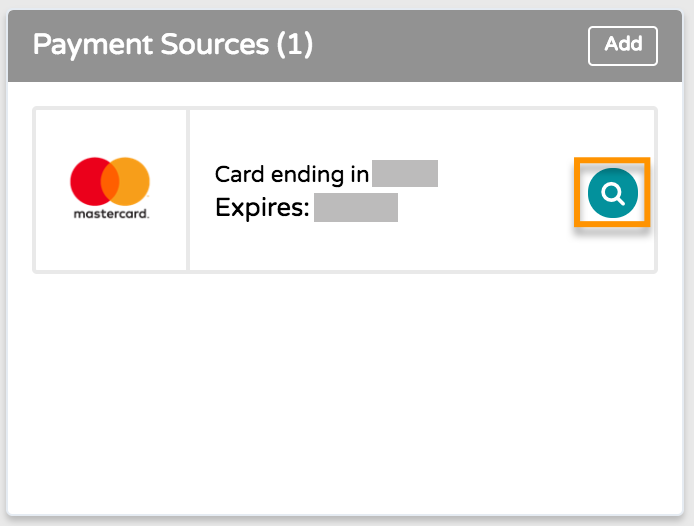 When you manually add a payment from your Flipcause dashboard, you have the option to assign that payment to a Contact Record in your database. Alternatively, you can also manually add payments right from your Contact Profiles. Using this method gives you more visibility and helps ensure that manually entered payments are attributed to the correct contact record in your database. From the dashboard, navigate to your supporter's Contact Profile. To do this, go to Contact > search by Name, CID, Business/Organization, or email > Search > locate their contact profile in the search results > View Profile. From here, you can follow the steps to Add a Payment. Note: the Contact Record Assignment and Personal Information sections will already be populated with your contact data. You can add relationships to any Contact profile, and those relationships can be with people in your database or outside of it. This area will list their name, the relationship type, and any relationship notes you enter. 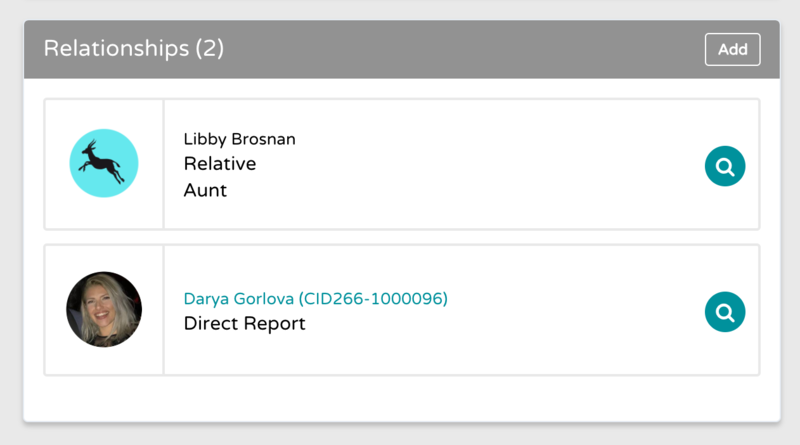 When you add a Relationship to someone who already exists in your Flipcause Contact Database, the Relationship will be added to both Contacts, and they will be linked together, with a reciprocal Relationship type displayed on each. 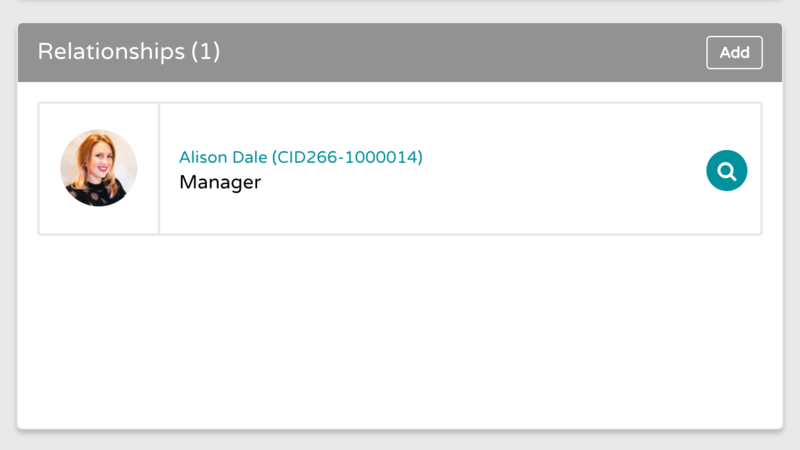 For example, if you add an existing Contact as the "Manager" of a Contact, than the two Profiles will link to each other from the relationships section, one will be labeled as "Manager," and the other as "Direct Report." The same will be true for "Grandparent" and "Grandchild," "Parent" and "Child," "Employer" and "Employee," etc. When you add a Relationship to someone who does not exist in your database, this person will not be created in your Flipcause Contact Database. The information will be displayed as a static reference in the Relationships section. If you want to add a Relationship to someone who is not in the database, and that you want to add to the database, create a Contact Record for them first, then add the Relationship to an existing Contact Record. • To view a year-end tax receipt / Annual Report for any contact, navigate to their Contact Profile and click Annual Report. Pick the year, and you'll be able to view a PDF report. 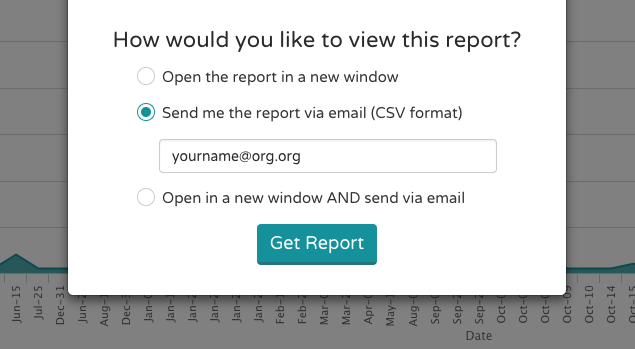 • To email the report to a single contact, simply click “Annual Report” and select the year, then type in the email to deliver it to. 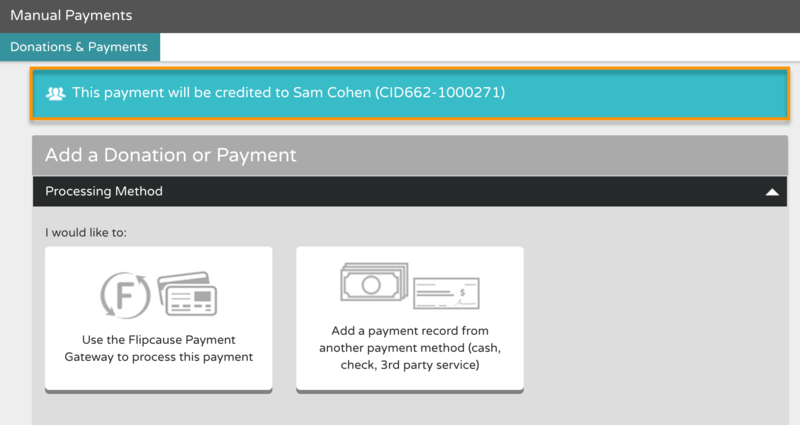 Soft Credits allow you to attribute credit for a contribution to an additional person without creating a duplicate record in your accounting. For example, if Tom Brady makes a $100 donation, then that $100 donation is naturally attributed to him. However, because you know that Tom Brady made this donation on behalf of his wife, Gisele Bündchen, you might want to give an "In Honor of" credit to her, without changing the donor's name for that transaction and without creating a duplicate financial transaction when only one donation was actually received. This is what a soft credit allows you to do. You can apply soft credits for any Flipcause Activity: payments/donations, registrations, sponsorship orders, item orders, and volunteers. You can use Flipcause's soft crediting to credit parts of an activity to multiple people, or the entire amount of the activity. To add a Soft Credit on Flipcause, navigate to the contributor's Contact Profile, and scroll down to Activity Activity History. Find the Activity Record, and click the magnifying glass icon to open the details overlay. Search your Contact Records to find the Contact that you’d like to assign the soft credit to. The Credit will then appear on both the Contact’s profiles, but the amount will only be counted once in your totals. Adding a Soft Credit to a user will not count toward that users contribution totals at the top in their At a Glance Stats. Contact reporting is used for your communications reporting: emails, direct mailers and mail merges. Your Flipcause Contact Database allows you to manage your contacts, households, groups, etc. and keep them updated. For this reason, your Contact Reports is where the contact information will be the most accurate and up-to-date. In contrast, your activity and transactions reports will only pull the information exactly as it was entered at the time of the transaction, leaving you stuck with potentially outdated emails or addresses, or ones that contain typos. We recommend pulling Contact reports for emailing, so that each person gets their own email. For something like direct mailers, we recommend pulling Group reports, to avoid sending multiple duplicate flyers to the same house. When your supporters enter their credit card information on Flipcause, it's tokenized and encrypted, and stored in your Contact Profile's Payment Sources. You can view these payment sources (but not ever view full credit card details), as well as add new payment sources manually. You can then use these to process additional purchases, donations, and payments. This area is located toward the bottom right-hand side of your Contact Profile page. 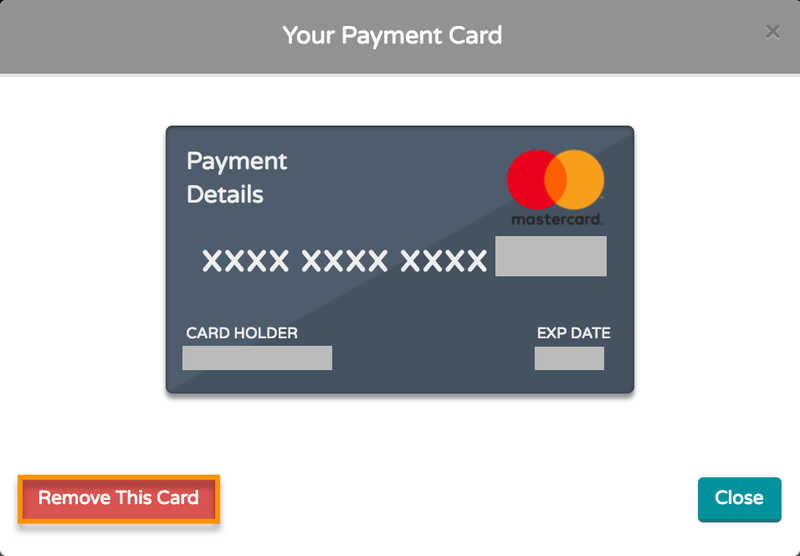 You can also remove a payment source by clicking the View icon to the right and then selecting Remove This Card. We're excited to help you import your data to Flipcause! To get the data import process started, please schedule a call with your Account Services Manager: https://calendly.com/fcservices/data-import. They will go over next steps and coach you on how to use tags, custom fields, and other things to look out for to ensure the cleanest data import possible. As such, we will need a separate CSV (or XLS) file submitted for each. But if you only have transaction data, that's ok. The system will automatically create contacts out of transaction data, along with the transactions. The need for a differentiation between the two is that they are not necessarily related. One contact might have several transactions, while another person might have no transactions. 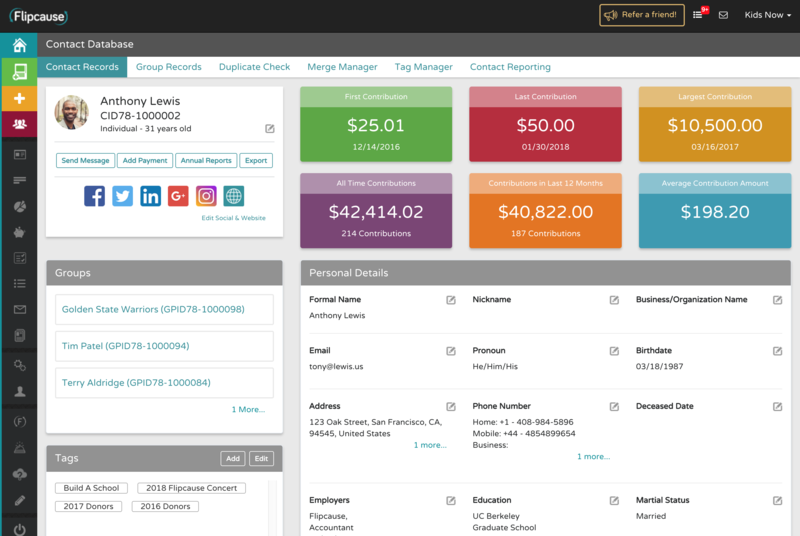 These two layers of information combine together to give you complete information in your Flipcause Database and to use it like a CRM (rather than just for bank data, or just for email addresses). If a single Molly Jones has 4 transactions, we want to be sure we create 1 Contact for Molly Jones with 4 Transactions attributed to her, instead of 4 Molly Jones contacts each with 1 Transaction. Unless of course, you do have 4 separate Molly Joneses in your database, in which case we'll want the latter. If you are exporting your data from another database, please include the CID (Contact ID) or other unique ID your current system uses. This will allow us to match the import by these existing unique IDs and get the data uploaded correctly. If you don't have unique IDs already, we'll match by email. This means that all data with the same email address will be treated as related to the same contact. If any data does not have an associated email in it, we will assign our own ID and upload those individually. This means if you have multiple entries for "Molly Jones" that don't have an email, they will all be uploaded as separate people into the database. This also means that if you have multiple entries for "Molly Jones" and some have an email and some don't, the ones with the same email will get matched as the same person, but the ones that don't have an email will be created as new people. It's not possible to undo or delete data imported due to errors in the submission file. To avoid duplicate errors, you'll want to review your data and clean it before submission. We will map your existing data fields to Flipcause data fields. Existing fields are composed of Flipcause standard Transaction Fields, Flipcause standard Contact Fields, and the custom fields that are in your Flipcause account. If your data file contains fields that don't match Flipcause standard fields, we will check to see if they match any custom fields in your account. 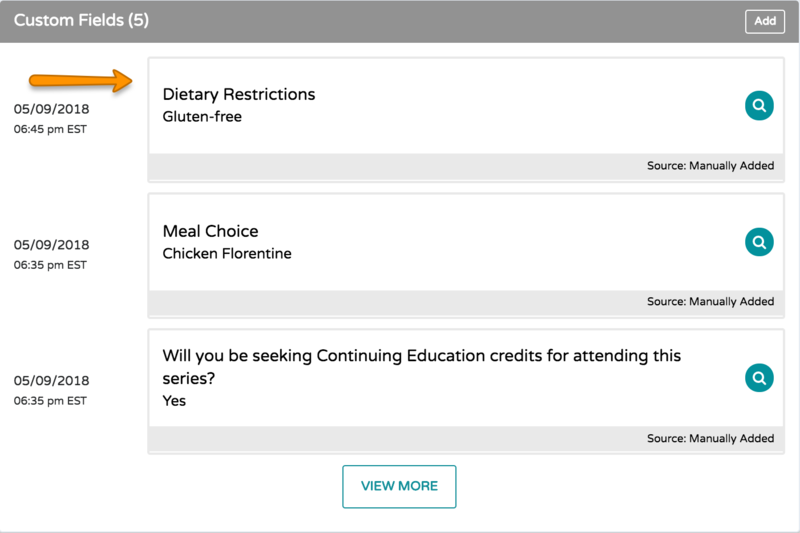 If they don't match any custom fields in your account, we will create those custom fields in your account first, to allow the full data set to be imported. 3. Remove any data you do not want imported before submitting your CSV. We will import all data submitted. If you want anything excluded, please be sure to clean the file you submit to us and remove any unwanted information. 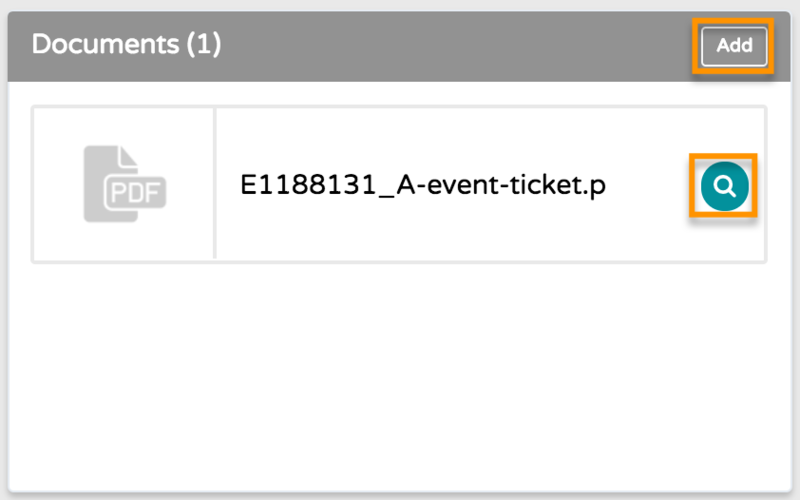 When supporters receive an event registration confirmation via email or sign a waiver, an encrypted .pdf version is automatically stored in the Documents section at the bottom of their Contact Profile. Click the View icon to the right of a Document in the list to access a link to the document, change its description, or remove it. You can also manually upload jpg, jpeg, png & pdf documents to a Contact Profile by clicking the Add button at the top right. In the Add Document window, enter a Name of File that will display in the Documents section (this does not have the be the same as your file name) and optional description. Use the Choose File button to select a file from your computer and click Save when done. Within a Contact Profile you will find a section labeled Communication Notes. Here you can log incoming and outgoing communication with your constituents including email, phone calls and in person conversations. (Note: Currently all communication will need to be manually added into this area of the CRM). To add a new communication log, find the Communication Notes area and click Add. Fill in the information regarding your communication. The options for "Communication Type" are: In Person, Email, Phone Call, SMS Text, Fax, Mail. Be sure to click Save when you are done. You can permanently delete contacts and their associated personal information from the Flipcause database. When you delete a contact record, all personal details, custom fields, notes, soft credits, important dates, relationships, and all data that has been added directly to the Contact record will be deleted permanently. Once deleted, this information cannot be recovered. Deleting a Contact will also remove them from their related Groups. Note: If the deleted contact is the Primary and ONLY Contact for any group, that group and all associated Group details will also be deleted. If the deleted contact is the Primary member of a Group with multiple members, then the member of the group with the oldest Added Date will become the Primary Contact. Use the Search or Sort options to locate the Contact Record you want to delete from the database. Then scroll down to find it in the list. Click the red Delete Record button in the right-hand column of that record. You’ll be prompted to confirm that you want to delete the record. Note: this action cannot be undone. Please be aware that deleting the contact record does NOT delete associated records that contain transactional data, including Transactions (and any manually added custom fields), Activities, Subscriptions, Peer Pages, and Payment Sources. This is because your Flipcause account is a Merchant Account (like your bank or Paypal account) where you cannot manually delete or alter your transaction history. Unassign all of these associated records. This will create floating records that you can reassign to a CID later. Reassign all of these associated records to another Contact ID. 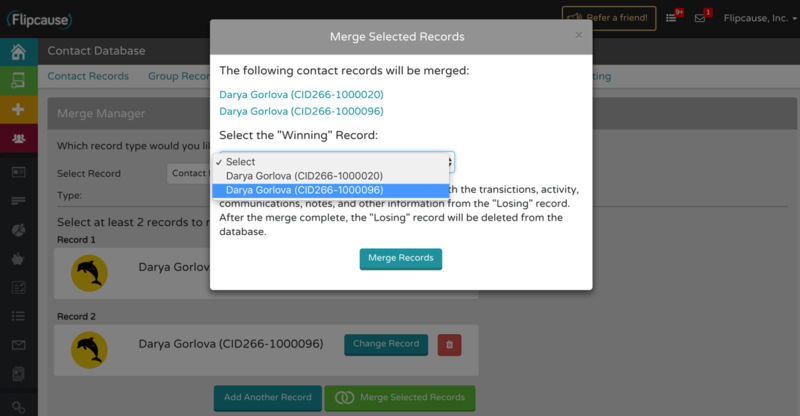 After selecting this option, you can enter the Name or CID of the contact you would like to reassign the associated records to and select it from the dropdown list. Click the checkbox to agree to the terms. You can also delete Group Records from the database. Note: deleting a Group record is permanent and cannot be undone. Groups are primarily used as a way to to group related individuals who share an address, and a common reason for deleting a group record is that individuals at a particular address no longer want to receive paper mail. 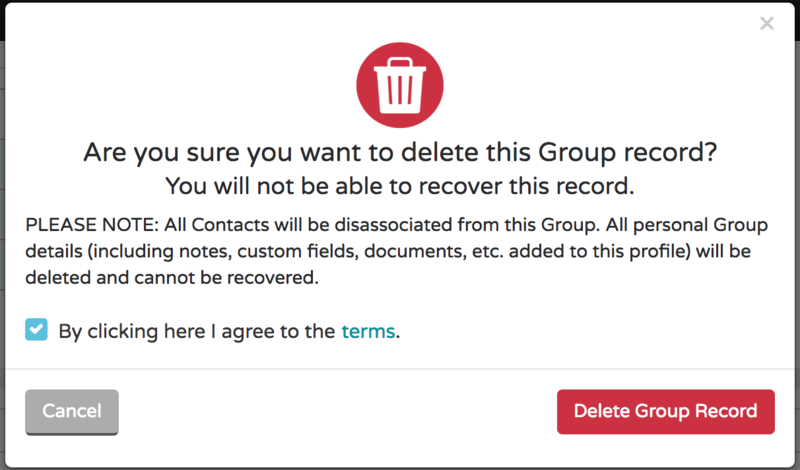 Deleting a Group Record dissociates all of the contacts within it. However, the individual Contact Records within the group will remain in your database. The difference will be that the deleted Group Record is removed from their profiles. When you delete a Group record, all of the personal Group details (including notes, custom fields, documents, etc.) will also be permanently deleted. Navigate to Contacts > Group Records. Use the Search or Sort options to locate the Group Record you want to delete from the database. Then scroll down to find it in the list.